The Forest of Dean is well known as an area of natural beauty, but there are some extra hidden gems in the area where you can eat and drink! As part of the Forest of Dean Bloggers Weekend (organised by the local Tourism Association), I sampled a selection of culinary delights around the Forest of Dean. I had to do each of the cafes and restaurants justice by writing a separate blog article about them. I have far too much to say about the weekend to cover everything in a single blog post! An overview of the trip as a whole, the accommodation and the activities that I took part in can be found in other posts. On Friday night I arrived at the cottage. After a speedy turnaround and quick wash and brush up at the cottage, Kate and I were collected in a taxi and taken over to Monmouth for an evening at Green & Jenks Gelato House. Saturday morning I cooked breakfast for myself; a bacon and egg sandwich, the ingredients for which were provided by Katie, our host at House of Bread Self Catering Cottages. This was followed by lunch in Katie’s cafe, Hot Pot Pottery, which is next door to the cottages where I was staying. On Saturday evening we ate at The Farmers Boy Inn, where we were well looked after with a three course meal in the cosy bar area by the fire. Sunday was another home-made breakfast – cereal this time as I was still full from my meal the night before! But I knew I had to eat something as we had another activity-filled day ahead. The final meal of the weekend was provided by The Forest of Dean Hog Roast Company, who cooked a delicious hog roast served with apple sauce in the beautiful Puzzlewood. On arriving in Monmouth, we headed straight to Green & Jenks Gelato House, where we were offered a choice of cocktails downstairs (I went for Gin, but there were cider cocktails available too). We had a little bit of time to mingle with other bloggers and chat to Gilly, the owner of Green & Jenks, while admiring the old photographs of Gilly’s family on the walls; her family has been in the business since the 19th century! Impressive! We were then invited upstairs to a bright and airy room with high ceilings, used mostly for events such as this one. We had a brief introduction from the Forest of Dean & Wye Valley Tourism Association, and the manager of the local Tourist Information Centre. Gilly also told us a bit more about the locally sourced food that she provides; using local dairy farmers and fruit growers for her Gelato, as well as a local bakery for bread and cakes and wild boar salami from the Forest of Dean! I also discovered that ‘Gelato’ is not just a fancy word for ice cream. The two are different in terms of their cream content and the way they’re made. Gelato is made with less cream content, so it’s lower in fat (less calories!) and it’s churned more slowly, giving it a more dense, less fluffy texture in comparison. I went for Creme Egg Gelato with fudge and marshmallow topping. Simply delicious. I’m not usually much of a pudding person (I don’t think I’ve actually had a dessert in any of my adventures so far for Wild Walks with Wine! ), but I ate the whole thing. I probably would have licked the little glass bowl clean if I hadn’t been wearing my ‘professional’ blogger hat! I really enjoyed it and would highly recommend Green & Jenks Gelato House for those of you visiting the Monmouth area. Towards the end of the evening, we were finally given our itineraries for the weekend, and got to find out the activities we were going to be taking part in! I’ve written about the activities in a separate post, to try to do justice to a truly action-packed weekend! Hot Pot Pottery is the name of the adjoining pottery, gallery and cafe to the self catering cottages where Kate and I were staying for the weekend. 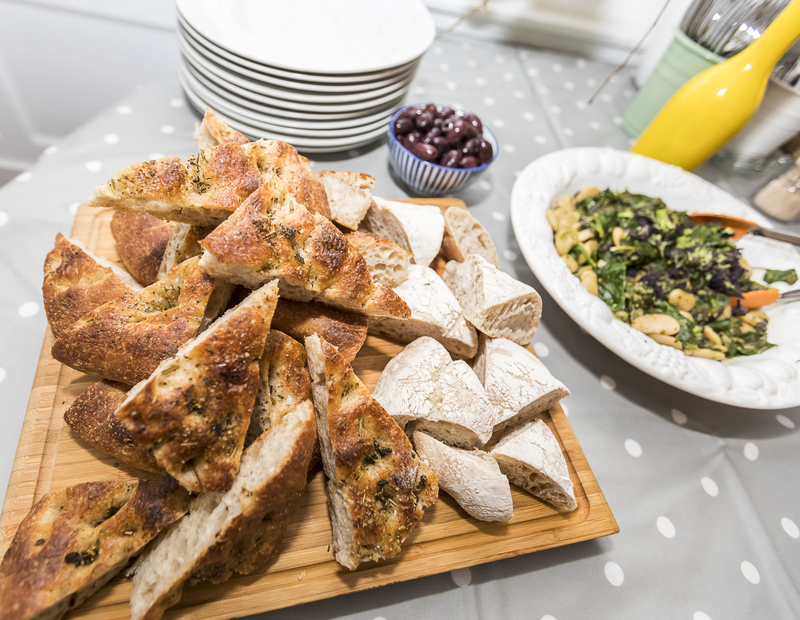 The food was a buffet style laid on especially for our group, offering fresh salads, warm breads and soup. The soup was leek and potato, and was a bit rich for my tastes, but others in the group said it was the best leek and potato soup they’d ever had! The atmosphere was cosy, with a selection of proper tables and a small cluster of comfy chairs and sofas gathered around a small wood burning stove at one end. It would definitely be a great spot for a quick coffee and cake after a long walk if you were staying in the House of Bread Cottages next door! After lunch, Katie did a quick demonstration of her pottery skills, ‘throwing’ the clay (that’s the technical term apparently) and sculpting a quick jug for us all to see. Having no experience of trying to make pottery, it was difficult to appreciate the skill involved. Katie makes pottery every day and runs courses and workshops regularly, so naturally, she made it look easy. Although I’m assured that it’s not. We had no time to try our hands at forming clay, as we were whisked off to the next activity! Our evening meal on Saturday night was at The Farmers Boy Inn, which was again around a 20 minute drive from the House of Bread Cottages in Christchurch. We were collected this time by the pub’s own mini bus service, although they do also offer their own accommodation. This was the only activity of the weekend which was disclosed to us in advance; we had pre-ordered our food. This proved to be something of a disaster, as nobody could remember what they had ordered. Luckily, the staff had a print out of the list, so rather than calling out the name of the dish, they called out our names, which worked out in the end. I do find this sort of confusion happens regularly with large groups. I recently went out for a birthday meal where we had to pre-order. Rather than trying to get us to remember what we’d ordered, Bav at Ox & Bone, Huddersfield read our orders back to us at the beginning, and allowed us to confirm/amend anything. Then as the food came out he called out our names, allowing the food to be delivered to us quickly and without incident. It also meant there was no shouting down the table – we all knew each other so just pointed the staff in the right direction if somebody wasn’t paying attention! Food at The Farmers Boy was excellent. I had mushroom soup, followed by the pork belly (accompanied by very crunchy crackling) and apple crumble and custard to finish. My only comment would be the lack of veg with the main. I like to have a small amount of greens on my plate, even just green beans or broccoli, just something a bit fresher to break away from the heavy pork and mash. I was so full afterwards; after an action packed day I was ready to curl up in a ball and sleep! After a brief walk around Puzzlewood and the chance to hear stories about it’s history, geology and use as a film set, we were lead to a small picnic area in the wood, where the group of bloggers were met by the delicious smell of a hog roast. The setting was perfect; a lovely end to the weekend. We were greeted by the well-dressed proprietor and waited for some of the other local business owners to arrive before tucking in to a delicious pork and apple sauce sandwich. I was starving by this point but enjoyed it so much that when offered seconds I polished that off too! The Hog Roast Company do outside catering, mostly weddings and private events (indoor & outdoor!). If you’re hosting something like that in the area, I would recommend them, but for me, the wedding planning is over! So I won’t be hiring them any time soon! We were given goodie bags, as a parting gift, which also included some food and drink from outlets that weren’t able to host a group of bloggers over the weekend. Chocolates from Harts Barn Cookery School, a bottle of ‘Legless Cow’ (yes we did all get different ones, I will make no assumptions here…) from the Hillside Brewery and a bag of very posh-looking Drinking Chocolate from The Burlap & Bean Co., just to name a few! Thanks guys! Thanks for reading about all the fantastic eateries I visited during my visit to the Forest of Dean. I must credit David Broadbent Photography for some of the photographs in this post. I would also point out that I reviewed these restaurants as part of a weekend for bloggers organised by the Forest of Dean & Wye Valley Tourism – so a huge thank you to them for hosting us! To find out more about the accommodation, my overall impressions of the Forest of Dean, and the activities I took part in over the weekend, please read my other blog posts, and feel free to like and share on social media! The food all looks amazing. I stayed at the Farmers Boy Inn last February and this post brings back happy memories. Really want to get over to the Forest of Dean again soon, I love the area.